The Legacy Award honor is bestowed annually to a professional woman leader who mentors other women, supports her community and excels in her career. Crystal Arlington was the first female in North America to hold both a certification in landscape and snow and ice management. Recently, she was selected among several nominations and reviewed by an independent panel of community judges from Gannon University's Leadership program including employees of Gannon University, the Gannon University Small Business Development Center and members of the W.I.L.D. Steering Committee. "Crystal Arlington is truly deserving as the winner of the 2012 Legacy Award; through hard work and determination Crystal has made her mark not only in our community but nationwide," said Betsy Bort, Vice President of Commercial Lending, ERIEBANK. "She started and has grown her business in a primarily male dominated industry and she has earned the respect of many. Crystal doesn't take 'no' for an answer; she's a go-getter and a great role model for other women." The Business Manager of Affiliated Grounds Maintenance Group, Inc. – Crystal's husband, Richard Arlington – is also in the news for his recent book, Why Not You? The book discusses how Richard, who was homeless at age 16, started mowing lawns. Ultimately, this was the springboard that, today, has him generating seven figures annually from his exterior maintenance service and real estate businesses. Use this link to see the entire press release on the book project; here is the link to check out purchasing the 'rags to riches' book on Amazon.com. 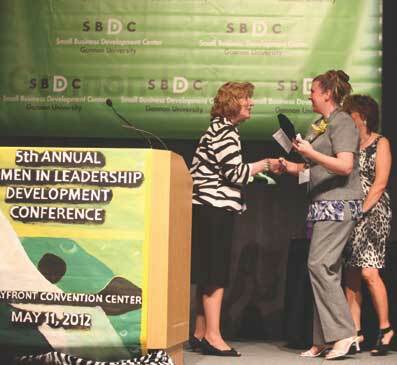 Crystal Arlington was recognized at the 5th Annual Women in Leadership Development (W.I.L.D.) Conference held on May 11, 2012 at the Erie PA Bayfront Convention Center. She received the legacy plaque at a press conference held at Gannon University on June 26, 2012. In the photo to the right, Crystal Arlington is presented with the W.I.L.D. 2012 Legacy Award by Dr. Melanie Hatch, Dean of Gannon University's College of Engineering and Business. "I am truly honored to be recognized by Gannon University and I am thankful for organizations such as the SBDC's Women in Leadership Development for their efforts in empowering professional and enterprising women daily," said AGMG CEO Crystal Arlington. Affiliated Grounds Maintenance Group, Inc., headquartered in Lake City, PA, has grown to encompass work in 39 states with over 4700 Affiliated Partner Contractors. The company provides exterior maintenance services including landscape maintenance, snow and ice management, lot sweeping and power washing to some of the country's largest companies and property management firms. For more information on Affiliated Grounds Maintenance Group, Inc., visit www.richarlington.com. For more information on Richard Arlington and his company, Arlington & Associates, visit www.agmgus.com or call (866) 923-AGMG.